Well, the rain never let up yesterday. I laid down to nap around 4:00 with it pouring down, and it didn’t let up until well after dark. 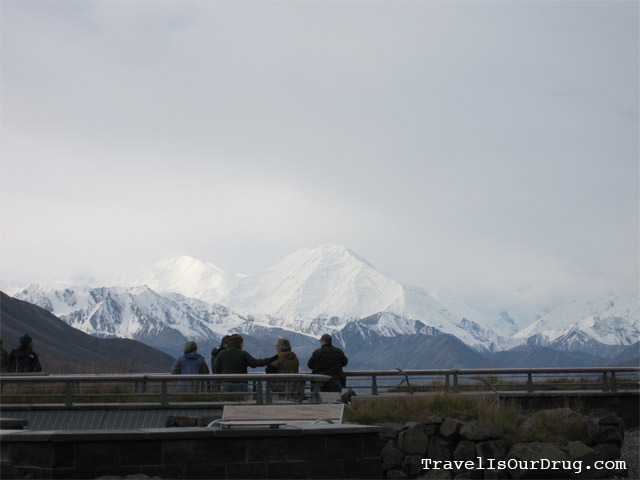 So our first full day in Denali ended up a sleepfest. I’m really bummed about the rain and the fact that we didn’t get to explore the area – especially since our good friend had recommended this site based on his amazing experience here a few years ago. But given the fact that our rain gear was only so-so and it had already proven ridiculously impossible to get clothes and gear dry with the chilly air, indirect sunlight and more rain nearly every night, there was no way I was going out to hike when I couldn’t positively know I would be able to get dry and warm again. So we decided to nap with the intention of climbing out and hiking as soon as the rain cleared. But no such luck. It was completely dark the first time I woke up and the rain had let up. Pooper. Scooper. I had some really crazy dreams, too. As we got off the bus yesterday, the ranger who had gotten off with us told us that there had been quite a bit of recent bear and wolf activity in Stony Dome – looks like that must have been in my head when I drifted off to sleep… In one dream, K and I were waving our arms trying to deter two grizzlies and they stood up and started waving back to us, all friendly-like, as if they were waving “hello,” then came into our tent to hang out. I woke from another dream where bears had been growling at us to find that the “growls” had actually been K’s snoring! We woke this morning a little after 8:00 and the next bus came through around 10:00, so we dried the tent and sleeping bag that best we could with our already-completely-saturated, super-absorbent micro fiber towels and packed everything up. 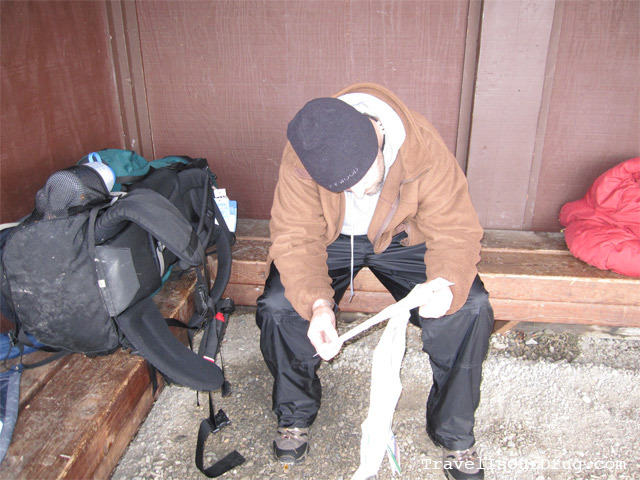 We put on our rain gear and the rest of our wet clothes since the best way to dry things out here in the cool air is to wear them and use body heat to dry them. We were both starving – I actually woke up this morning to the sounds of both of our stomachs growling – but we decided to head out to Kantishna and cook once we got there. We kept out some trail mix to hold us over until then and started our hike back out to the road. 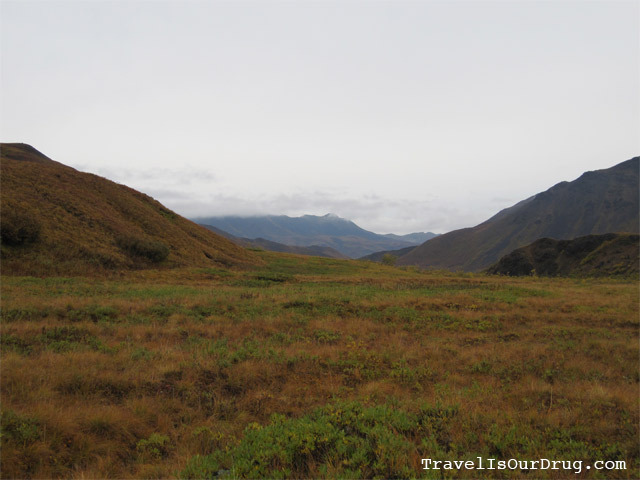 Even though the Denali principle is “Leave no trace” and there are not any established trails, we found a bit of a trail through Stony Dome. It was just a dirt path, only about a foot wide at most, cut through the brush up above the river and gravel bar. It appears that it’s just a popular spot for hiking and camping – definitely a path shaped by many, many people (or perhaps animals) following the same path, not man-made by the NPS. We followed the trail for a bit since it was a lot easier to walk on than the spongy tundra. After a little while, the trail disappeared into a really big patch of tall brush. Rather than face the possibility of dealing with a bear so early in the morning, we decided to drop back down onto the gravel bar and follow the river. The river wasn’t very wide and was really shallow at that point. We walked along the edge of the water and rock hopped a bit to keep our feet dry, until we realized that the water level had risen considerably since we hiked in yesterday, and we would have to get our feet wet in order to keep following our trail from yesterday along the gravel bar. So, in an effort to keep as dry as possible, we climbed back up out of the riverbed. The bank was really steep and made up of loose dirt and gravel that gave way under our feet, making forward progress really difficult. It was so steep that I actually had to get down and crawl up it to avoid my pack weight sending me backward off the slope. We made it back up to the road and only had to wait on a bus for about 5 minutes. 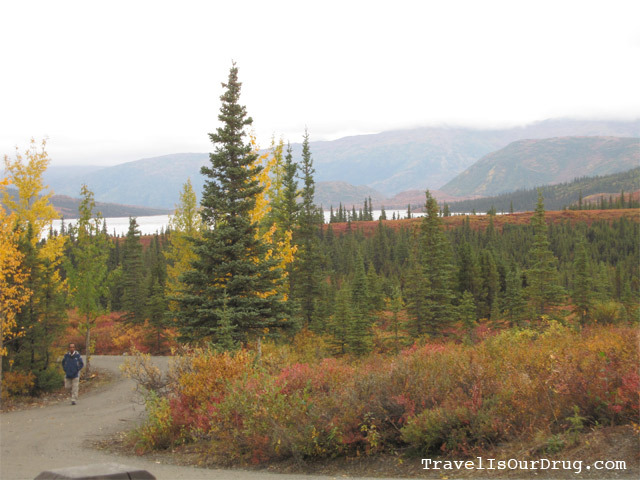 The first bus to come by wasn’t a camper bus – it was one of the tour buses to Eielson Visitor’s Center and was full of elderly people. They had room for us, so rather than waiting for the next camper bus, we hopped on and decided to catch up with another camper bus at Eielson. As we left Stony Dome, the sky was still pretty overcast with the sun trying to poke through. But as we drove further into the park, the sun began to shine through more and more. 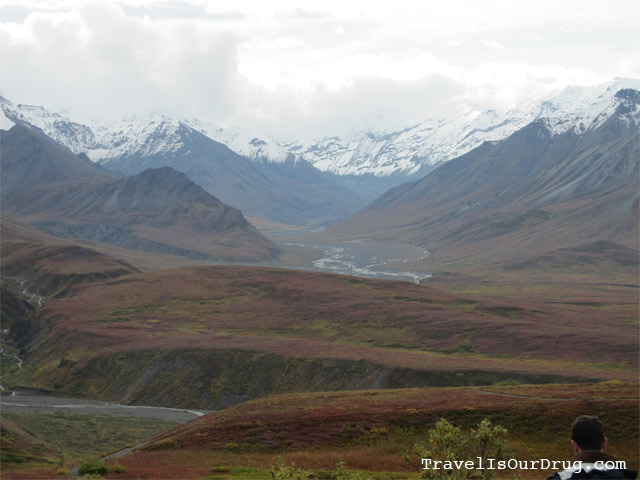 As we came around a corner near Thorofare Pass, we were able to get another view of Denali – a partial view this time. We were able to see all but the very top portion. The way the clouds were siting on the peak made it appear as two separate mountains. Had we not gotten amazing, full views of the mountain on Saturday, I would have been a bit disappointed with this view. But since we’ve already seen it all, I was content and entranced observing the way the cloud cover changed, quite literally every minute. The clouds were like translucent ghosts crawling across the jagged peak. 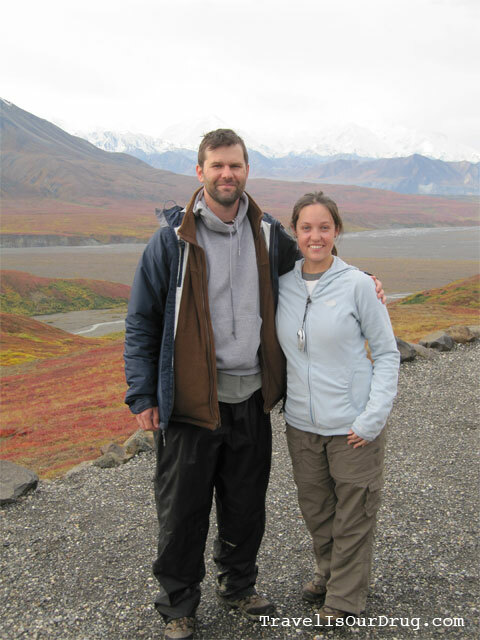 As we pulled into Eielson, the weather was turning pretty nice. We got off the bus and found another camper bus in the lot headed to Wonder Lake with just two spots left. 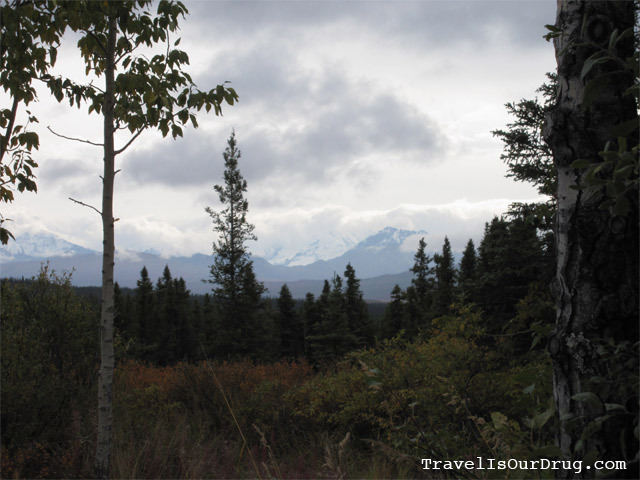 While we were waiting for the bus to leave, we loaded our packs on the back of the bus, went into the center to brush our teeth and fill our water bottles, and snapped a few quick photos of the Alaskan range from here. Back on the bus, the only two free seats were in the very back and close enough to talk, but not next to one another. So with no one to lean on, a quick nap was out of the question. But we did tear into the trail mix and devour quite a chunk of that. After eating only granola bars yesterday – and realizing this morning that i hadn’t drank a single drop of liquid yesterday – my body was pretty pissed at me and dying for some food and water! 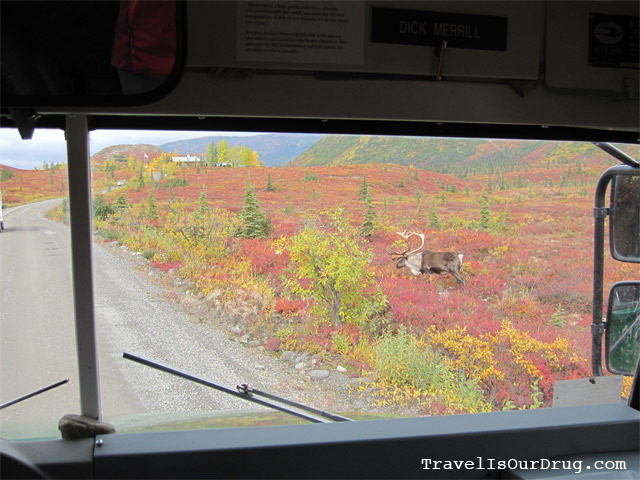 As we left Eielson, the view from the bus had changed from the rolling, vegetation-covered hills to vast, expansive, deeply fall-colored tundra, growing in the distance to rolling, round-topped, smaller mountains; then in the even further distance bursting skyward into the rocky, snow-capped Alaskan range – including Denali. 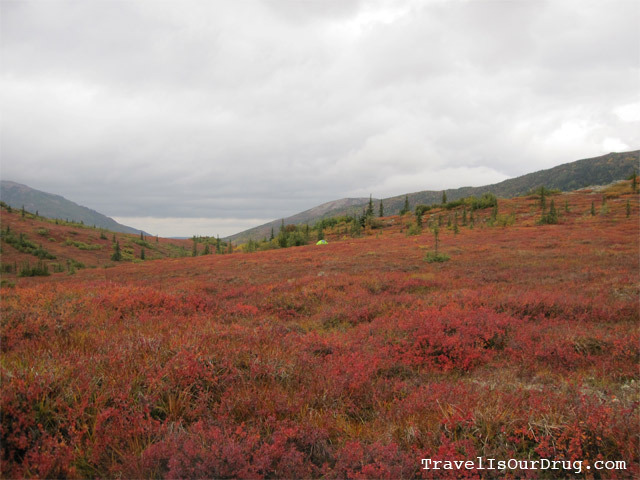 The tundra included vibrant red blueberry bushes along with other bright orange brush and the sporadic burst of birch trees changing over to yellow. 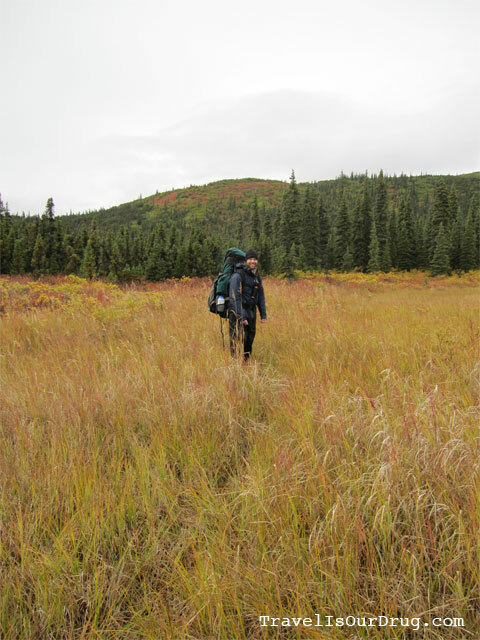 There were also frequent small tundra ponds surrounded by marsh grasses. 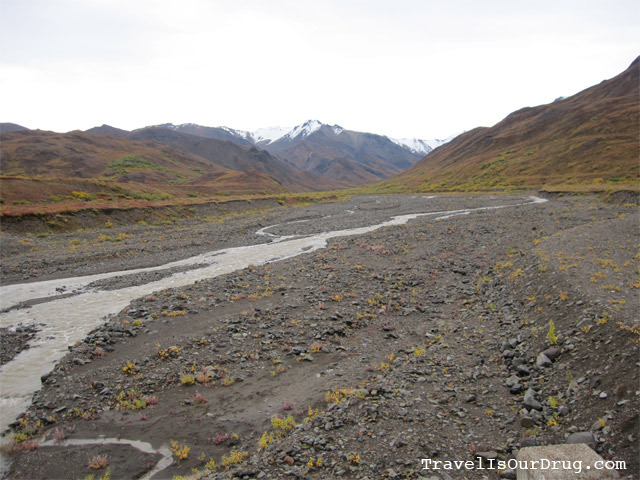 At some point, there was a drop off to a gravel bar, likely cut away by glaciers, with a small creek flowing through. 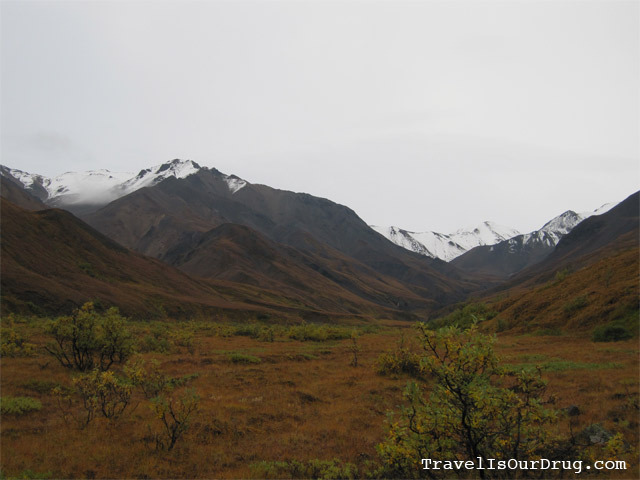 An older man on the bus who frequently visits the park pointed out to us that there is an area down in the valley that appears to be tundra, but it is actually a spot where tundra vegetation has begun to grow on top of a glacier. 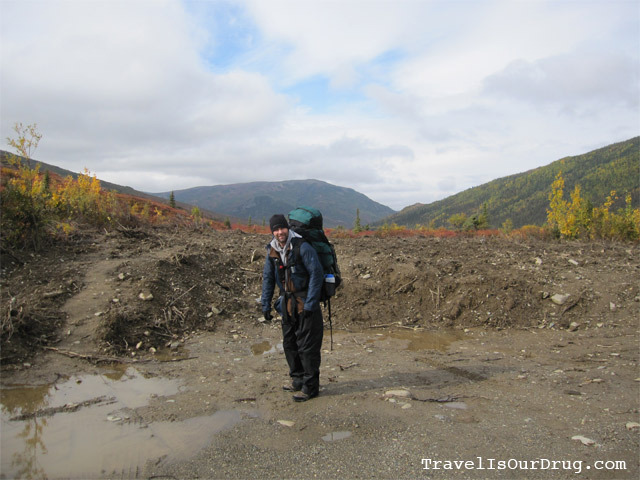 From up on the road it was impossible to tell it’s a glacier – pretty cool! Unfortunately, I couldn’t get any photos since I didn’t have a window seat or a clear, unimpeded view. This bus only went as far as Wonder Lake, which was okay with us because we wanted to make sure we got to see it before we left. It would have been great if we’d had nicer weather and been able to see the reflection of Denali in the water, but no such luck. Still, we got some great views and photos of the lake. 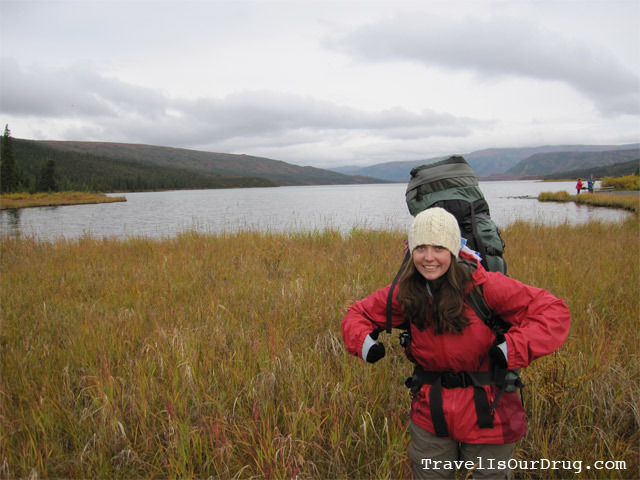 When we got off the bus, we had a decision to make – wait another hour for the next bus out to Kantishna or hike out of Wonder Lake through Zone 15 and into Zone 43. 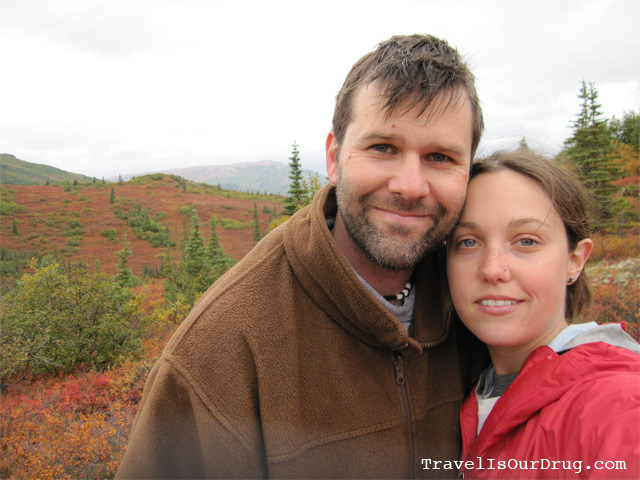 We decided to start hiking, but quickly changed our minds after we saw how thick the brush surrounding the lake was. We hiked into the brush and straight up, trying to find some thinner brush that was easier to push through, but it almost seemed to just get thicker the further we walked. It would have been a loooong walk to Kantishna through this stuff. 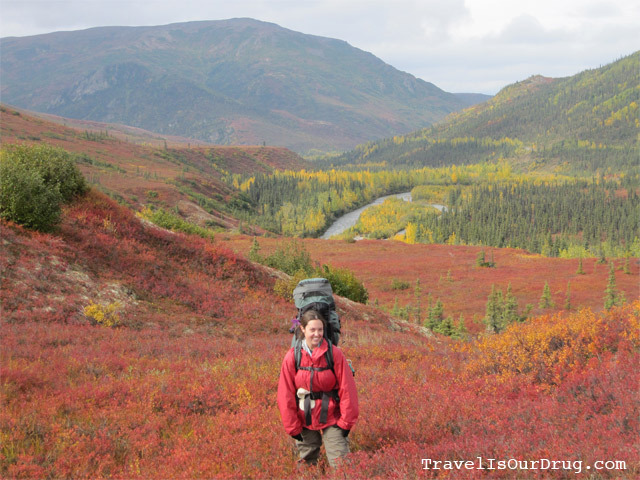 The ground was covered in thick, spongy tundra plants making it hard to walk. It looked like regular ground covering, but once we stepped on it, we just sunk down in and kind of bounced back out. It was almost like bouncing along in moon shoes rather than hiking and it was expending a lot of energy to keep momentum up even the slightest inclines. Not to mention, the possibility for encounters with bears is much greater up in the brush because they’re feeding on blueberries (which cover nearly the entire ground in this area) this time of year. It’s also easier to startle them with such low visibility through the thick, tall plants. I didn’t really want an encounter with a bear in an area where we had no quick, clear-cut route for escape, so we turned around and hiked back out to wait for the bus. We sat in the bus shelter for a bit, chatting with some of the people we’d been on the bus with yesterday who had camped in Wonder Lake campground last night. They told us they felt really badly for us yesterday – when we got off the bus it was pouring rain, and by the time they got to Wonder Lake, the sun was out. It’s crazy how the mountains affect the weather so drastically here, and how many different weather systems exist within the park at any one time. We got on the bus with the people from yesterday and headed toward Kantishna. They were going out to see some beavers in a three-tier lodge they’d constructed in a pond out there. 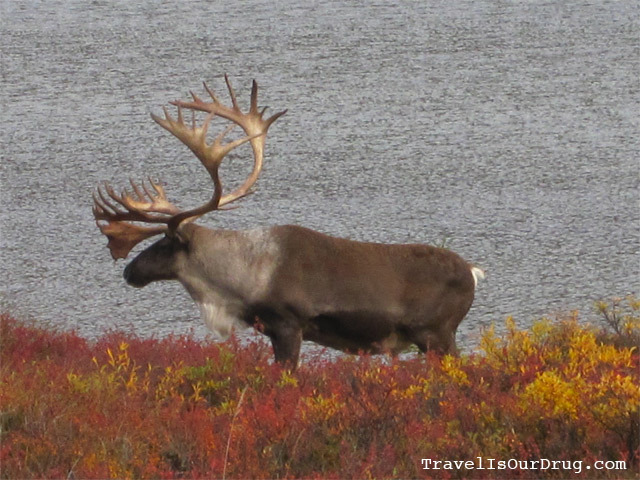 Just as we were getting to the beaver pond, we had an incredible caribou experience! 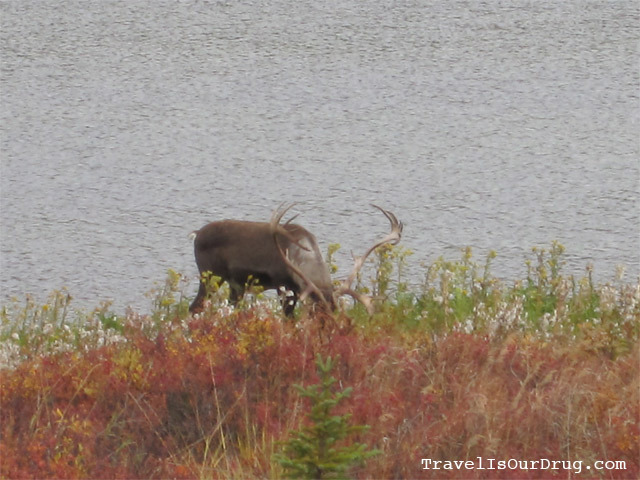 We looked over to the right side of the bus to see an enormous bull grazing on grass beside the pond. He was very leisurely eating a bit, then raising his head – almost as if posing for my photos – then lowering his head to eat some more. 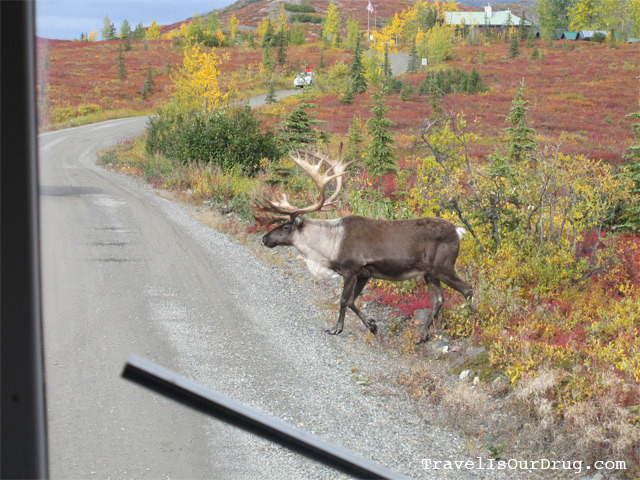 We watched for several minutes as he calmly ate before he started making his way toward the road, then trotted across in front of the bus and off into the brush on the other side of the road. It was so cool to see such a huge, amazing creature up so close and so naturally! A few more minutes on the bus and we were dropped at the “tractor trail” into Zone 43 in Kantishna. 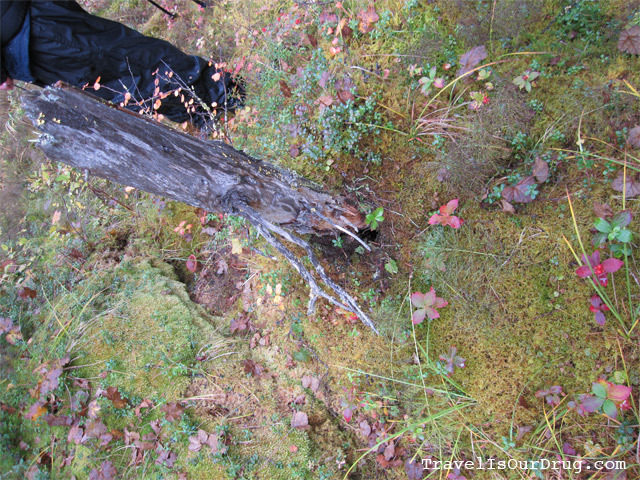 The trail was a dirt path – maybe 12 inches wide – through the lichen and thick bush of blueberries knee-high on either side of the path. Thank God for that path, or it would have been slow going. The rough part here was getting out of sight to set up camp. The trail went straight uphill in plain view of the road, a lodge and a set of private cabins up on the hill opposite from us. Another challenge to deal with is that all of the creeks in Kantishna are contaminated with heavy metals from mining activity, so we can’t drink from any of them, even after filtration. Climbing up that hill with our packs (mine was 45lbs! ), having only eaten 2.5 granola bars and a little trail mix, and not drinking any water was pretty awful. About 90% of the way up the hill, the ground leveled a bit. I threw my pack down, laid out on it and relaxed for a bit taking in the surroundings. 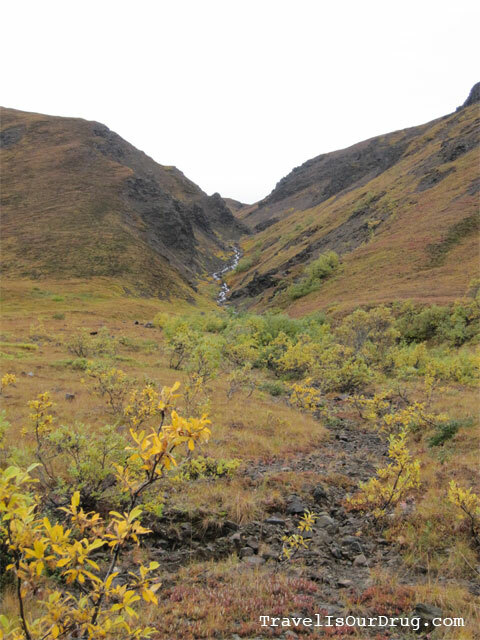 Over to the left, we spotted a tundra pond – safe water – and decided to chug some of our water and go filter more. Thankfully we didn’t drink it all because we walked over to find that it was impossible to get far enough into the pond to find water that wasn’t murky from mud (and would clog our filter) without trudging through marsh and getting our feet soaked. Knowing how difficult it had been to dry out and stay warm, we decided against it. We’d either conserve what we had or come back later if we needed to. So we hiked back up, picked up our packs and continued up and over and around until we found a hidden spot to set up camp. We planned to set up, eat and then go for a hike. We found it a little challenging to find a spot for the tent amongst the ground covered in blueberry bushes and other shrubby type brush. It was going to be completely impossible to set up anywhere but right in the middle of a bear’s kitchen – evidenced by the lovely piles of poo we found amongst the berries every couple hundred yards or so. So we did the best we could – we found a nice, flat, cushy patch of lichens just big enough for our tent, removed from the taller brush and providing us as clear a line of sight from our tent as possible in this landscape. 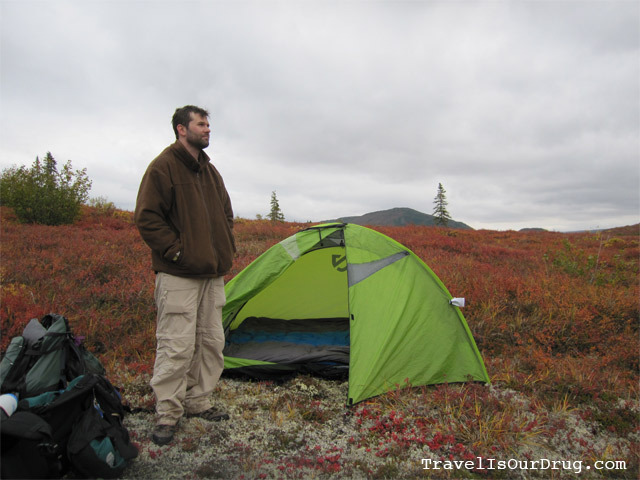 We set up our bedding, threw the packs inside, picked a food site and dropped the canister, then picked a cook site to start dinner – chicken flavored rice. Finally – some “real” food! We spent a good 7-8 minutes just trying to light the burner with the wind really about to get the best of us. We finally got it lit and got the pot on over the flame just in time for it to start raining. AGAIN. Seriously. I about frickin’ lost it! Thankfully it only misted and sprinkled as we cooked so the stove stayed lit and we stayed mostly dry. 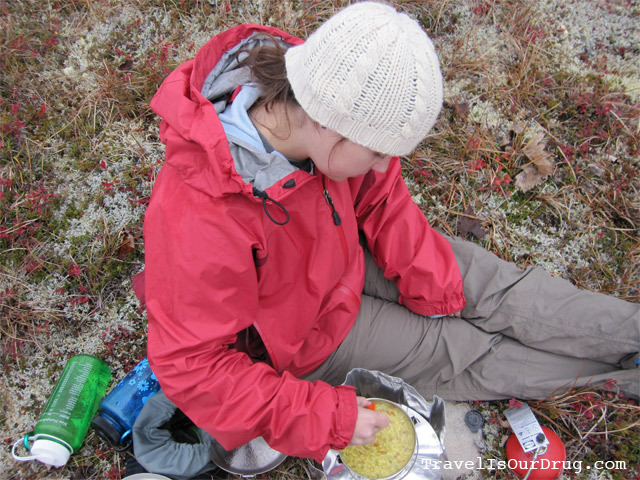 I cooked our feast as K kept watch for hungry animals – bear spray in hand, itching to use it. We’ve decided to head back out and camp in Riley Creek tomorrow night instead of staying out here again, so that we’ll definitely be back in time to make the train on Wednesday. We’ll decide based on weather and what time we wake up tomorrow whether we’ll get on the 8:45 bus out or whether we’ll hike around a bit and get the last bus out at 2:05.